The Henry F Vaughan Public Health Building-School of Public Health I (SPH I) was constructed in 1942, and a series of additions were completed in the 1940’s and 50’s. The renovation portion of this project will provide a modernization of building systems in SPH I including new mechanical, plumbing, electrical, and life safety systems. Other improvements to SPH I include a new roof and air conditioning of all spaces. 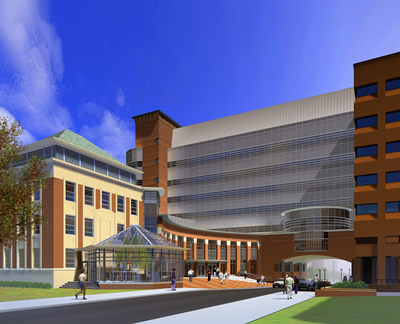 The plan will also construct a 125,000 gross square foot addition to SPH I which will span Washington Heights and connect to the Thomas Francis Jr-School of Public Health II Building (SPH II). The addition will be seven floors plus a penthouse for mechanical equipment and will house modern open laboratories, instructional spaces, student and faculty interaction spaces, and offices. The east wings of SPH I will be demolished for the addition as well as the existing bridge between SPH I and SPH II. All labs in SPH I will be relocated to the addition, and SPH I existing space will be converted into office and dry lab research space. Minor renovations will be made to SPH II. The renovation work will include approximately 2,000 square feet on the seventh floor as well as providing a connection between SPH II and the new tower at each floor. A phased construction schedule is planned in order to minimize disruption of the academic calendar, with construction scheduled to begin in Summer 2003 and be completed in Fall 2006.